Nobody is sure where the meatball originated and early recipes are difficult to find. It's easy to ascertain though, that meatballs as we know them, made with ground meat, were not possible until meat grinders were invented. Early meatballs would have been made from leftovers and hand-shredded. Or pounded with a heavy object and minced with primitive tools. Food history tells us that meat was rare across the world and was enjoyed mostly by the rich. It was precious, so it can be assumed that it was never wasted, and no parts of a cut of meat or the leftovers would have been thrown away. Simply put, meatballs was a way to utilize this extraneous meat and squeeze another days' meal from it, not to mention another days' nutrition. The type of meat prepared as meatballs was varied and influenced by geography. In China, for example, the mainstay was the pig, so their meatballs were likely made from pork. Similarly, in North Africa the Berber were shepherds of wild sheep whose fatty tales were prized. Whatever the meat, whatever the region, many recipes indicate some form of meatballs across the globe. Preheat oven to 400 degrees. Line baking pan with foil, then spray with nonstick cooking spray. In mixing bowl, add ground pork and remaining ingredients, except barbecue sauce. Mix well ( I used my hands to mix). Shape into 1 inch meatballs, making sure all meatballs are the same size. Place on baking pan about a inch apart. Bake 23 to 25 minutes, or until no longer pink in center. 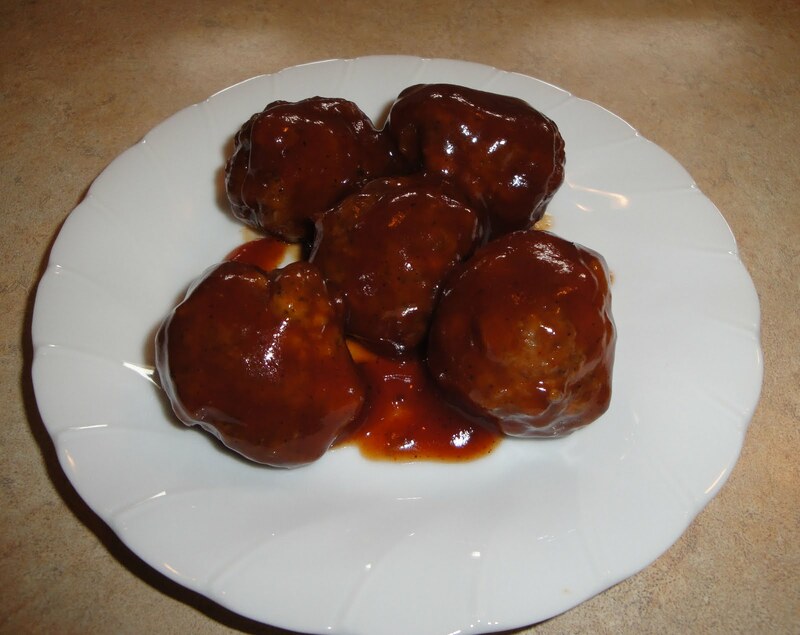 In a large nonstick skillet, add barbecue sauce, then add cooked meatballs. Simmer until heated through. Stir occasionally. Enjoy! Note: Take one meatball and cut in half, just to make sure they are done. Oh my, these look fabulous Christine! Hi Mari, thanks so much. I say this a lot but I also feel I could never say it enough... Thank You! Y’all make me smile and brighten my day. I have great people who take time out of their busy lives to read my blog. I love how many of y’all also take the time to comment, good conversation and helping to make us closer. I love to read your comments and cherish them all, as well as the folks who write them! Please feel free to chat with each other in comments as well. I know that I read a comment that really makes my day, I'm thinking that this may happen to you as well. If you have a question, feel free to leave me a comment or send me an email. Y’all make yourself comfortable here! Have fun! Ooooh! I love meatballs... and your look fabulous! I made Chinese style meatballs just last night, but they didn't survive long enough to get pictures :) Thanks for sharing this :) I love stopping by your blog! Christine, Thanks for stopping by my blog! You have some lovely recipes here. :) The meatballs look great- they'd be a nice change from the beef ones I usually make. Love the sauce too! Hi Jeannie, plain rolls would be good with the meatballs. I served the meatballs with mashed potatoes. Thanks for stopping by. Hi Harried Cook, Chinese style meatballs sound good. The meatballs I made didn't last long. Thank you very much. I love stopping by your blog too. Hi Betty, thank you so much! great recipe christine!!! meatballs are always a hit at any party. i make german beer meatballs and people love them! Hi Junia, German beer meatballs, wow, I bet that's good. Christine, these meatballs look so juicy delicious. I bet they taste wonderful with some pasta. Yummm.... Thanks for sharing. Hope you're having a great day. These look absolutely delicious,I really must give them a go. By the way nice blog Christine keep up the good work. Hi Mac, thank you so much! That means a lot to me. Delightful meatballs. Love liquid smoke, a little goes a long way. Hi Lazaro, I love liquid smoke too, and I always have it on hand. Your right, a little goes a long way. Thanks for stopping by. Interesting meatballs, never made them out of the pork..they look wonderful and sound so tasty! They look delicious! I love honey barbeque sauce! Hi Christine, Thanks for visiting my blog and leaving your nice comment. I remember these delish pork meatballs from at least 30yrs ago, that I made as a party platter with smaller meatballs. Yours look so perfect, and yummy! that sauce sounds great. liquid smoke is a tiny component of the overall dish, but it adds OH so much! I noticed that in your directions you said ground beef, I assume you meant pork. lol I thought I missed a step there for a minute! I can't wait to try these! Thank you so much for letting me know. I have updated. Thanks again, Julie. Enjoy!